Following on from the Assembly meeting last week, Heidi Alexander (local MP) has made a petition against Network Rail raising the car park charges. Lost my key so stayed in Blackheath O/N. Very pretty. But stop calling yourself London. You're about as close to London as Milton Keynes. The Blackheath assembly meeting took place tonight. First up was Sir Ian Mills, asking everyone to please use the Bakehouse Library. Apparently it has lots of kids using it, but not enough adults. £800,000 of development work is due to take place by 2015, including grand plans to turn the two upper floors of the Reminisence Centre into a kind of community centre. The Bugle sat on his hands and didn’t ask anything impertinent about local council’s obligations being overtaken by charities – I hear it’s all the vogue these days. Then onto Olympics, where a nice lady called Emma told us that we would all be consulted, and that our feedback was essential, but that she couldn’t really confirm anything very much, as she wasn’t a technician, and that all the important people were at Greenwich council for a planning meeting that was unfortunately scheduled to coincide with the assembly. Lots of questions about parking and permits during the Olympics – many from Kevin Bonavia, who made sure to turn to the audience whenever asking a question… He’ll go far I’m sure. Emma smiled, nodded, and apologised through them all. She couldn’t specify a month by when we could be certain about the parking situation. There will be bus stop closures on Ha Ha Road. “Will there be parking on the heath?”. Yes there will, but only on one day (July 30th), and only by coaches picking up olympic believers from Blue Water, and depositing them on Prince Charles Road. But the coaches will be on matting, so the grass will be ok. Originally LOCOG had promised that there would be no parking at all on the heath. There will also be a bike rack and taxi rank in Talbot Place. A question about this: “If I’m a resident, can I still park outside my house?”. No blooming idea. Come along to the informal chit chat at the Clarendon Hotel on 3rd & 4th February, where all will be revealed. One Talbot Place resident was particularly cross about the impact that the taxi rank and bike racks would have on disabled people in the area. “I’ll feed that back”. “What will happen to the DLR? Will it be able to cope?” “TfL have done lots of lovely modelling. There are some very colourful models on their website”. Then it was Liz Dart – Community Engagement officer from Lewisham Council, who was up to talk about the plans for the Olympics Live Site (the big screen planned to go in front of Taste of Rat). Liz last addressed the Assembly back when Blackheath still had a proper library, but I digress… We were about to be PowerPointed, but Lewisham council make all their staff use secure USB sticks, which never work, as anyone who has attempted to use one in a Windows machine can attest. She went through the plans, which looked the same as the ones which have been highlighted previously on this site. She mentioned some of the activities that will take place – tea dances, comedy nights, sports films. Some of these will be ticketed, and some will be free. Zone 3 will contain a climbing wall, and a roller skating rink which sounds rather fun. It will be run by a company with an amusing name which sounded a lot like Bottom, but I’m sure it wasn’t. It wont’ be a fairground – there won’t be loud music, and no “callers” (not sure what they are). The staff & contractors used will be the same teams that are used for Fireworks night. Emergency services will be the same teams as usual, except for the police, who will be all centrally controlled from the Met, due to the Olympics. Lot of questions about noise from the big screen. One very annoyed man pointed out that whilst the screen is facing away from the nearby homes, this means that the cheers from the crowds will be projected towards the homes. Also pointed out that it’s near a busy road. The location was determined by the Locog events nearby. They don’t expect 5,000 people for the majority of the time. The deciding factor will be the weather, and how well Britain is doing in the Olympics. “Will it be ticketed – isn’t it too many people?”. Fireworks attracts 100,000. It won’t be ticketed. “What about the grass?”. It will be maintained by Glendale as usual. Question about screen times, and adoloescents loitering, upsetting young families. Answer: 8am-11pm but only if there is interest. Alcohol won’t be served throughout these hours, but will probably be available from midday at weekends for example. “What about seating? Can we bring our own?” No fixed seating will be provided at the site. There may be hay bales, or something of that nature. You can bring your own seat. Apparently there will be a firework display this year, touch wood. The live site event isn’t expected to make a profit, and there are strict rules about commercial activity so close to an Olympic venue. Initially a school dinner provider wanted to try and break a world record at the site (for the most dinners served? Largest omellette? Can’t remember), but this level of sponsorship wouldn’t have been allowed. The overall cost is thought to be around £150,000, but some income will be derived from attractions, partnerships, etc. The licence decision for the live site is due to be decided at a council comittee next week. i got the feeling that they’re pretty sure it will be approved. Then it was onto Heidi Alexander talking about the Localism Bill. * These forums can declare “local assets”, such as pubs, churches, etc to be added to a special List. * Anything on this list cannot be quickly sold or got rid of by the owner. They have additional obligations to discuss any sale with the council. Either an extra 6 weeks or 6 months delay is added, to prevent quick sales of local assets. So this raises interesting questions: Who can form a Forum? Are there concerns about groups forming forums specifically to exclude other groups? The legal status of these forums appears murky as the legislation currently stands. Should the Blackheath Society form a forum? 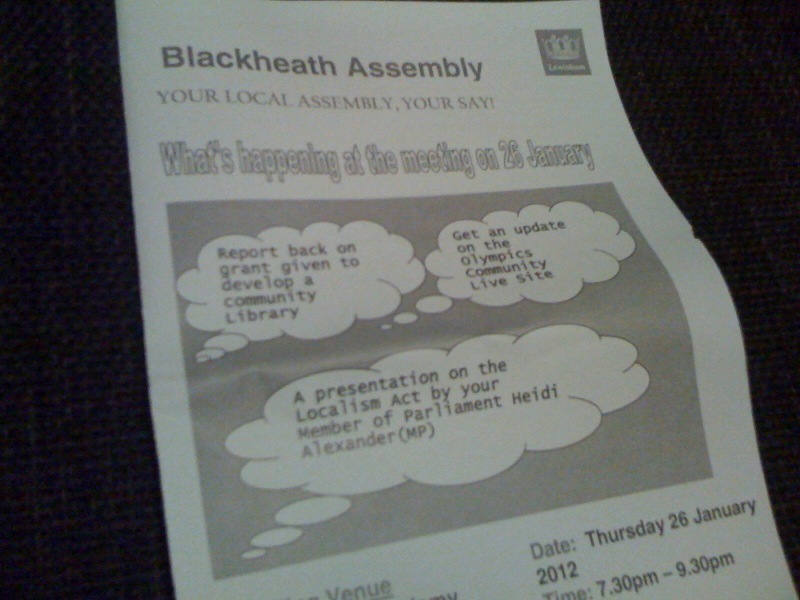 Should the Blackheath Assembly be a vehicle for a forum? 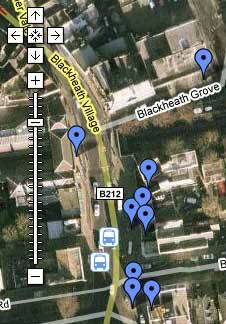 What would you like to see on a list of Blackheath Assets? One suggestion was that the station car park could be added to such a list, to prevent National Rail from screwing with it. UPDATE: See the petition about the station car park. “London 2012 Olympic officials have purchased a Crown Estate lease on a pocket of land called Circus Field adjacent to the controversial Greenwich equestrian site after negotiations with three Government agencies. There’s another Blackheath Assembly tomorrow, ​Thursday 26 January, from 7.30-9.30pm​ at St Mathew’s Academy, St Joseph’s Vale, SE3 0XX​. There are also draft plans for parking in Greenwich and Lewisham during the Olympics shown here (PDF). More info here. And then “informal drop in sessions” (not consultation) will be held at The Clarendon Hotel on Friday 3 February 2012, 12 noon–8pm, and Saturday 4 February 2012, 10am–4pm. By Flickr user KhE 龙. (Click this link to enlarge). Used by kind permission. Betfred are making a fourth (and hopefully final) attempt to turn Deptford’s old Nationwide Halifax Building Society into a betting shop. They’ve been turned down twice by Lewisham Council, and once by the Planning Inspectorate, but they only need to succeed once to permanently install yet another betting shop into their high street. Over on The Deptford Dame, you can find out more info. I am objecting to this application because I feel we already have more than enough betting shops; not only does it reduce the diversity of the businesses on the high street, but this clustering encourages anti-social behaviour, street drinking and fights in a small, concentrated area, putting people off using the street at night and making them fear for their personal safety. The deadline for objections is 17 February 2012. Please pass this on.